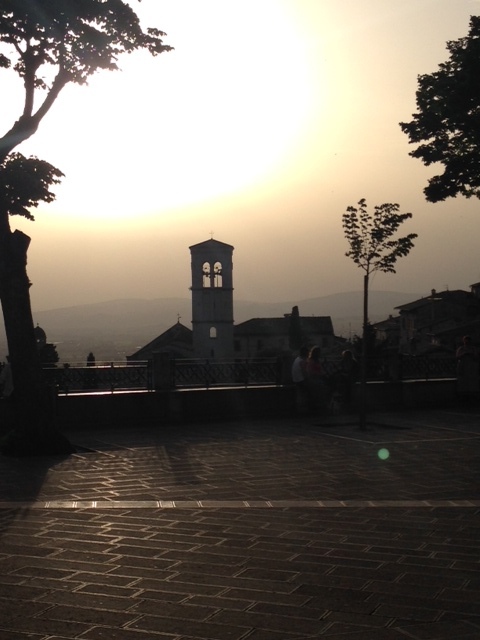 There is something about Assisi that invokes the miraculous. It’s no wonder that it’s been a place of spiritual pilgrimage for more than two thousand years. The Roman Temple of Minerva (just a minute from our flat) would have perched overlooking the Spoleto valley before the town grew up around it. In German feudal times, walls were constructed over crumbling Roman ruins to create a walled city, complete with two looming medieval castles and graceful cathedrals. You can see it on the visitors’ faces as they make their way through Assisi’s winding cobblestone streets. The arched doorways and narrow passages give way to steep stairways that beckon to climb higher, higher. And so you go, in search of the view that must have inspired others to walk this same pathway for thousands of years, countless of times before you, just to take in this particular scene…yet somehow, when you round that corner, there is the sense that you are the first to have truly seen it. The very streets and hillsides of Assisi ring with a collective spirit of wonder. It is this spirit that led me to search for the perfect hiding place for the last clue in a scavenger hunt — knowing that 30 days from now a dear friend and her daughter will walk the same path to find it. Perhaps it’s also what granted me the Grace to stand inexplicably alone for fifteen minutes in a lower chamber of the Cathedral of St. Francis on a day that was swarming with tourists. In that quiet space, I stood listening to the very fibers of St. Francis’ tunic, quietly communing with the needlework of the followers who lovingly stitched patches over the tears in the rough fabric. It must be this same spirit that urged another friend to pass along a message which drew me to discover new doorways and answered questions in the walls of Chiesa Nuova. I sat for a full hour gazing at frescos before I felt an urgency to go – now – rushing down the street in the direction of the Basilica of Saint Claire. There was another urgent internal voice – stop, here – which led me to a small shop, where I bought a warm shawl on an 84 degree day. I hurried down the sunny street, skirted inside the basilica, and sat in the second row of the Chapel of the Crucifix of San Damiano, just as a nun entered the room and lit a tall candle. As I settled before the ancient, painted cross of San Damiano, the chapel suddenly filled behind me. Within another minute, a voice raised in an angelic soprano, and as the others joined in chorus, I became aware that I had unknowingly walked into a mass offered entirely in song. I wrapped my new shawl around my shoulders, grateful for the warmth, totally filled up…knowing for certain that if this small miracle could happen for me in this one brief moment, greater ones than this are possible for all of us. This entry was posted in Blog on May 6, 2015 by Leigh Hopkins. Wondrous, oh yes, Leigh. I’m with you in spirit. And so grateful for that. I hear the song, I see the miracle. It is marvelous being on the other side of our time in Italy and to enjoy the view and walk that pathway so many others have walked, with you, feeling it anew through remembrance. Beautiful, I can feel the miracles with you. Thank you for this post. Thank you for the reminder to listen and heed the inner voice. Thank you for the reminder of miracles.